Cruz was somewhat of an enigma coming into the 2012 season. Popular opinion was pretty split on whether Cruz was a legitimate wide receiving threat, or just smoke and mirrors. The latter relied upon the fact that Cruz relied a lot on big plays during his 2011 campaign. For the first half of 2012, the Cruz believers looked like the smart owners, as he put up three 100-plus yard games and seven touchdowns in his first eight games. The second half was not so kind to Cruz, as he only posted three more touchdowns the rest of the season, and had four different games of that span where he went for less than forty yards. What concerns me about Cruz is not so much the drop off in yardage as much as the drop off in targets. A lot of fantasy football boils down to the simple formula of “(Talent x Opportunity) = value”. In his first eight games, Cruz was targeted no fewer than eight times in each game. He was targeted eight or more times in only three games in the last half of the year. With the recent release of Ahmad Bradshaw, I think the Giants might have to rely on the passing game a bit more. Eli threw sixty fewer times this past season than he did in 2011, but in this new NFL with more wide-open offenses (thanks in large part to rule changes), I think that Coughlin moves more towards relying on his quarterback, especially if Cruz’s running mate Hakeem Nicks can get healthy. Recency bias and fears of big play reliance may drop Cruz in 2013 drafts. But that’s not exactly fair to him – he still did post those incredible numbers in the first eight weeks of last season. We can’t just discount that. I think that, depending on your league, Cruz could have some good value. I do not think he will be the trendy guy he was last year, though some early fantasy drafts still have him going in the early part of the third round. My guess is he slips a little bit come August, and if he does I’d be ready to pounce. Smith has fallen in some of the young 2013 drafts, and I remember a ton of people jumping off the Smith bandwagon in droves during the 2012 season. I’m not really sure why. After the bye week in Week 6, Smith received no fewer than seven targets in any of his remaining eleven games. The problem for Smith was he just simply could not find the end zone, scoring only four times all season. Smith had only six fewer receptions and 220 fewer yards in 2012 than he had in 2011 – a 2011 that saw the Panthers wideout shoot pretty quickly up draft boards. The problem was that Smith found the end zone almost twice as frequently in 2011. As of now, Steve Smith is being drafted behind Antonio Brown, Mike Wallace, Stevie Johnson, Greg Jennings, and Danario Alexander. I think the hate has gone a little bit too far. The fact is, there’s really not much else for Cam Newton to throw at in Carolina. While the system has changed to a much more of a quarterback-rush-heavy offense, especially at the goal line, touchdowns are somewhat of a random occurrence. My feeling is that Smith got a little bit unlucky last year, as his numbers were not far off his 2011 campaign. The Panthers, as a whole, got sort of a bad wrap in the fantasy community, mostly because they did not return value. I suspect at this point Smith is quite a bit undervalued, and will continue to be so. What does T.Y. stand for? I think it stands for Tons of Yards. After putting up a dud against the Jags, Hilton had 100 yards and two touchdowns against the Patriots and didn’t really slow down. In the last seven games of the year, Hilton hit the 100-yard mark three times, and scored six total touchdowns in four different weeks. I would imagine a lot of risk will be attributed to Hilton based on his big-play reliance like my boy Victor Cruz. While Cruz averaged about 12 yards per reception in 2012, Hilton average 17 yards per reception last season – the big play is very much Hilton’s game. T.Y. didn’t quite see the targets as say, Reggie Wayne, but it became apparent that Andrew Luck found a little bit of chemistry with Hilton as the season progressed. In the nine games during November and December, Luck targeted Hilton six times in five of the nine games. With Hilton’s explosive ability, that might be all he needs to live up to his stock as a ninth-round pick. What I like about Hilton is the fact that he does not need a ton of catches to make a difference, and that Luck seemed to look for him more and more down the stretch. 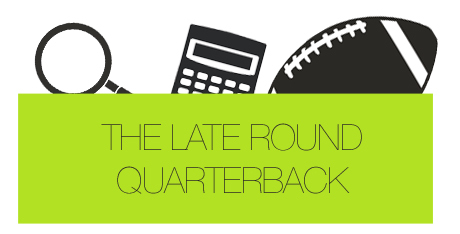 With young quarterbacks, I try and find a player that the quarterback seems to trust. Barring the obvious connection Luck feels with Wayne, I really think Hilton could be the main beneficiary of a full training camp with Luck. I don’t think Hilton’s stock will move all that much, but he is probably a guy I will target if he’s still hanging around in the ninth.